SOSUA, Dominican Republic- $570 was the total cost I had to shell out for me and my small family to purchase air tickets on Spirit Air from Santiago, Dominican Republic to Guatemala City. $285 each will get us one click away from El Salvador, our next base of operations. Published on February 28, 2010 by Wade Shepard Follow me on Twitter here. This price is not extremely bad considering that is for two paying travelers and includes $40 in checked baggage fees. Though it would have been $200 cheaper if I booked it last week. We had to purchase these tickets in two rounds: we first had to buy two tickets to Ft.Lauderdale and then two more from there to Guatemala City. In all, we purchased four plane tickets. The Spirit Air website does not compute flight connections, so travelers who want to travel to one of their destinations that is not a direct route must first buy a ticket to a hub and then a completely separate ticket to their real destination. This is probably so they can charge a checked baggage fee twice or some other underhanded intention. Spirit Air is a budget airline, and budget airlines cannot be trusted. We called up their customer service department to ask them how we could book a ticket that included a connection, and was told that we would need to pay a $15 fee to make a telephone purchase. There is no way to book a flight with a connection over the website. $570 was the total damage for these flights, but three months of living in a $50 to $100 a month apartment in the hills of El Salvador should gouge a little bit out this brash expense. The slower I travel the less it costs. 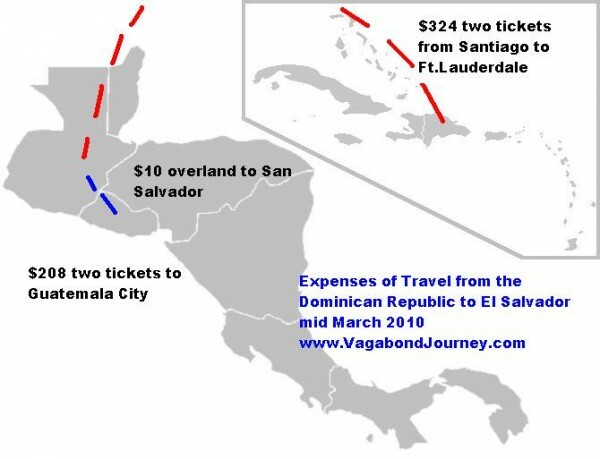 El Salvador will hopefully even out our income/ expense ratio, and allow us to live on the rations that Vagabond Journey.com provides. I hope you make it to Apaneca while you’re in Salvador. Its my favorite village by far. Easily worth a month of your time. Cheers. I hear you man. sometimes the tickets between carribean islands cost the same, like ticket from Carribean to Europe…which is funny….